When it comes to taking care of our dogs, we often limit ourselves to taking care of their food and nutrition only. How often have you fretted about your dog not getting enough or proper amount of water? Dogs are active creatures that need quite a lot of water every day. Even though the required amount depends on many factors such as size, breed and age, it does not change the fact that they need clean water at regular intervals. While you might ensure that you always have water ready for them in a bowl so that they can drink whenever they need to, have you thought about how contaminated that water becomes with passing time and with every water refill? Would you have wanted to drink such water? If the answer is “no”, and you want to know how you can provide fresh water to your dog 24/7 without any hassle, then dog crate water bottles are the solution! Read on to find out more about these useful products. If you have a small puppy or any other small pet such as a rabbit, guinea pig or a chinchilla, then you can definitely consider this bottle as a good option for you to buy. 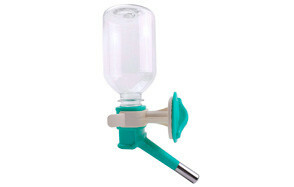 It is small enough to fit into small crates and is ideal for use with small animals who would have problems drinking from bigger bottles due to the extra force needed. However, if your little pup is a biter, you have to be a little careful. Customers have said that the metal mouthpiece can be a bit weak and might get bitten off, and the plastic of the mouthpiece might develop holes if it is chewed on too much. Dimensions: 9 x 5 x 2.5 inches ; 6. 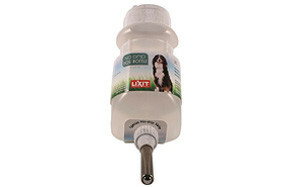 Lixit Corporation also has a good range of dog water bottles; hence they too have multiple items on this list. This one, in particular, is a gem of thing as it is perfect for medium-sized dogs! 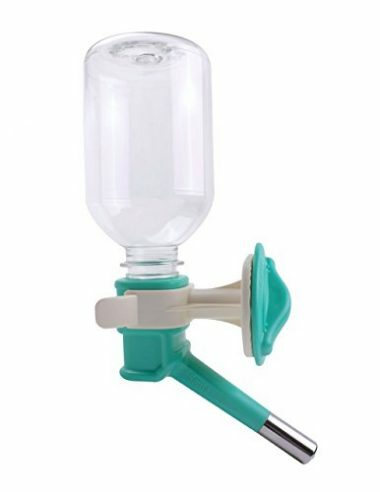 It is a top fill bottle which means that you do not have to even remove it from its bracket for refilling! Customers have said that the capacity is perfect for medium-sized dogs and lasts through the night. We also recommend it for travelling due to its sleek design! If you have some really small puppies who are just starting to get their own water and food, then you really should look into this bottle. Choco Nose does indeed do a great job in making this small water bottles for small puppies. When they are young, using a dog water bowl can be really inconvenient for puppies as they do not have proper balance. If you don’t want a wet pupper wandering around your house, then you should make this bottle with a tiny nozzle of 10mm available to them. Using a dog crate water bowl is never convenient, but the main reason we think so is often only because of the mess it makes in the crate. While having a wet crate 24/7 does seem pretty filthy, one major disadvantage of bowls is that they cannot be carried around anywhere. 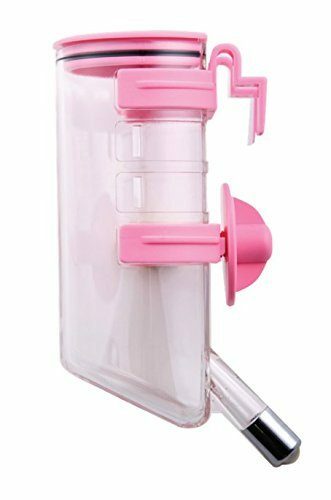 It is almost impossible to carry both water and bowl SEPARATELY, hence we recommend this collapsible water bottle dispenser that is great for long walks or travelling. This bottle has great reviews in terms of sturdiness and longevity, therefore you can rest assured while buying it. 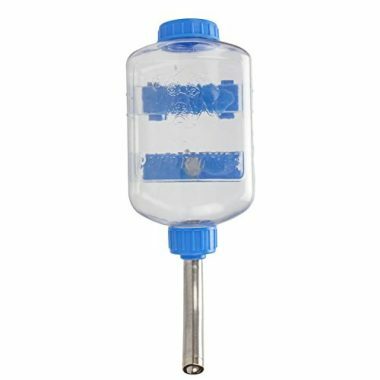 Wanna satisfy your dog’s never-ending need for water? Then SatisPet is definitely what you’re looking for! Jokes apart, this water dispenser has some great reviews as well. First of all, it’s extremely aesthetically pleasing as it has a nice blue colour. 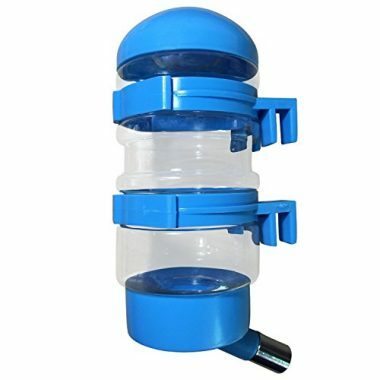 It has a different hanging system compared to other bottles, which makes it more reliable and sturdy. However, you might face some problems trying to get both hooks in place as they are quite widely-spaced, sometimes more spaced than the bars in the crate. Customers have reviewed that the plastic is quite hard so your dog won’t be able to chew through. The second last contender of Choco Nose, this is bottle has a bigger nozzle diameter which means it is meant for bigger dogs or puppies. It’s definitely one of the prettier options as it looks quite different from the first 2 models, and yet has even better reviews. 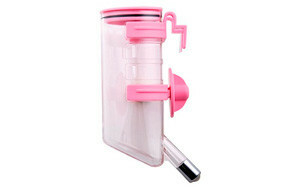 Unlike the previous models, it has a top fill lid which allows you to fill it from the top without opening the bottle. Customers have reviewed that it hooks on to crate very easily too. Finally, something for the big guys! Most of the bottles we’ve suggested till now have been great for small to medium sized dogs, but this one with a huge capacity of 30 oz and 16 mm nozzle diameter will definitely be perfect for big dogs. An advantage of this bottle is that it has a dual design which makes it convenient for hanging on the crate AND being taken on the go. Most of the reviews it gets are of 5 stars, so you can understand the quality! This water bottle by Lixit is another one specifically for big dogs. It has an opaque, wide mouth with a big ball point tube cap. It’s quite convenient for travelling due to its sleek design. However, some customers have reported that their’s leak, so make sure you check yours thoroughly. Buying a dog water bottle or a dog water dispenser is not the easiest of tasks, especially if you want one that will be effective for you and will last a long time as well. All dogs do not have the same requirements. For example, small puppies do not need much water while they are still breastfeeding, but after that, they require much more while they are growing up. Adult dogs also need a lot of water as they are most active at that point in life, whilst old dogs usually rest more often hence do not drink as much water. Size and breed are also important factors. Some dogs, like the German shepherd or the golden retriever, are usually large dogs. The water consumption of dogs depends on their weight (the requirement is per pound), hence the larger dogs require much more water than tiny poodles or Chihuahuas which are much lighter. Similarly, carpet dogs that stay indoors for the most part of the day, have much lower requirements of water since they do not exhaust themselves much, compared to the more active breeds which are always busy running around both inside and outside the house. Where are you going to use a dog crate water bottle? Or in easier words, are you going to use it indoors or outdoors, and how often will you be traveling? If your dog usually stays indoors, then a dog crate water bottle or a dog water dispenser somewhere near his usual spot might be all that you need. If it stays outdoors, you can set up a water fountain and teach your dog how to use it (training might take a little time), or if it stays in both places, then you can have a fountain outside and a dog water bottle for indoors. On the other hand, if you travel a lot, then you should have a dog travel water bottle that preferably has some type of bowl attached to it. The bowl is really useful in preventing spills or any other messy scenarios. What size dog crate water bottle do you need? There are many sizes of dog water bottles and dispensers. This is mainly because there are many sizes of kennels and crates, hence you need something that will properly fit in place AND be accessible to your dog/puppy easily. 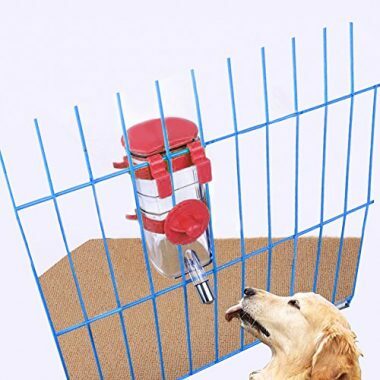 We’re emphasizing on being accessible as we have often seen that owners bought a bottle that was either too small or too big, which resulted in their dogs not drinking from those bottles or dispensers at all, sometimes even avoiding their kennels too. Also, take into consideration the capacity of the pet water bottle you’re about to buy. If you buy a small one for a very big, active dog, you will be spending a big part of your day refilling it. On the other hand, if it has a too large capacity, you will not be able to use it very conveniently or travel with it. Moreover, if you’re too relaxed about refilling the water, it might turn stale if it’s in the bottle for too long. BPA-free plastic, stainless steel, and ceramic are the materials used in making a kennel water bottle, and they all have certain advantages and disadvantages. If you have a dog that likes chewing, then you should buy a steel or ceramic one even if it’s a bit expensive as they will last you longer. Plastics get scratched and harbor bacteria in those cracks, hence they eventually become unsafe for usage. When you’re buying a product for your pet, you obviously want it to last. There is no point in buying something solely because it looks good, as aesthetics does not ensure quality. Hence, make sure the bottle or dispenser or even bowl you are considering to buy is robust and strong so that it can withstand the poking and shoving of animals and humans alike. If you’re buying an electric dispenser, ensure that the cable is chew-proof. Even if you do buy a sturdy dog drinking bottle or dispenser, accidents can occur and a part of it might get damaged. Which is why you should also find out whether spare parts are available for that model and if they are, how much they will cost. On the other hand, you cannot just ignore looks on a whole. Anything that does not look pretty to you will not appeal to your pup either. For accessibility, choose simpler designs so that your dog can drink from it easily. Moreover, a complicated design will have areas that will be hard to clean. Dogs shed fur so it is only natural that whatever item you use will accumulate dog hair too, along with types of debris and dust. Hence it is extremely important that you choose a bottle that can be easily opened, cleaned and then put back together. First of all, the main advantage of dog water bottles over bowls is that it’s much tidier and manageable. When you use a bowl, your dog will probably spill some water EVERY time they drink water (they aren’t as civilized as we are, after all!) hence you’ll have a mess to clean up regularly, especially if your dog plays outside often and comes in to drink water. Moving on to why specifically dog “crate” water bottles are beneficial, the main reason is that dogs can get thirsty very often. In the summer months, dogs require water at frequent intervals to keep themselves cool, hence it is important that you keep water available for them nearby. This can be easily done using water bottles that can be attached to the side of a wire crate. Moreover, you can easily monitor the amount of water your dog is consuming to understand whether it’s healthy or not, as drinking too much or too less water are both symptoms of sickness. Dog crate water bottles usually have a no drip and dripless design which ensures that they will not make the crate wet so that your dog does not stay in a wet environment (prolonged exposure to water might make them sick). They are usually easy to clean and refill, so you really don’t have much to worry about. Just like any other household item you own, dog crate water bottles need to be cleaned and maintained too. While cleaning them regularly is obviously the best option, it’s not feasible. Hence, we recommend that you wash it at least once a week as otherwise, you’ll be risking bacteria formation. Remove it from its place in the crate. Unscrew it carefully and detach all removable parts. Pour a drop of liquid detergent into the bottle. Fill it to 2/3rd mark with warm water (the way you would wash any other bottle). 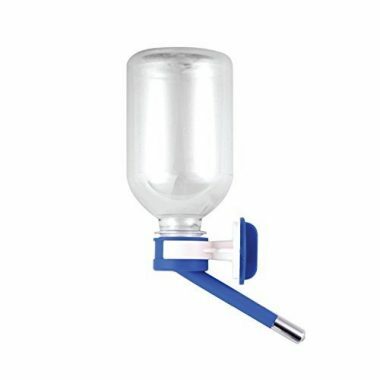 Screw back the cap and other attachments (sipper tube, plastic filter etc.) and then shake vigorously. Clean the other attachments individually. Be careful with the sipper: use a soft soapy sponge and make sure you’re not damaging it in any way. Rinse everything THOROUGHLY until you make sure there is no soap left on anything. Make sure you get all the soap out of the bottle, sipper and water holder. On the other hand, if you have a dishwasher, and your bottle is dishwasher-safe, why go through all this hassle!? Q: How much water do dogs need? A: Basically, the exact answer depends on your dog’s activeness, age and breed, but on a general note, most dogs need around 8.5 to 17 oz of water per 10 pounds of their weight per day. If you notice that your dog has a water intake level significantly lower or higher than these numbers, then it is better to plan a visit to the vet. Q: How does a dog crate water bottle work? A: A crate water bottle is usually mounted in the crate wall, from which it hangs in a vertical position but does not drip. Most water bottles have a metal seeping tube that has one or two metal ball bearings inside the tube that enable the bottle to hold water by forming a vacuum. The metal ball keeps a drop of water between the ball and the open end of the seeping pipe. When the movement of the ball disrupts the vacuum (due to leaking or nudging of the dog), the seal breaks and water falls. Q: How do I train my dog to use the dog crate water bottle? A: To train your dog, you’ve to make it accustomed to how the bottle works. Obviously, since your dog is not used to it, it might be a little apprehensive and hesitant to even come near the bottle. However, to get over this problem, you have to make sure the bottle is covered in your scent (rub it on your body if needed!) and then show it to your dog and ask it to come near. When it’s near enough, show it how the bottle works using your own fingers. You can hold out your wet finger so that it can sniff and lick to understand that it is indeed drinking water. When you show the mechanism multiple times, your doggie will eventually learn. However, if it takes longer than usual to learn, make sure you have an easier alternative source available (such as a bowl) so that it doesn’t get dehydrated when you’re not paying attention. Q: Where should I place the water bottle in the crate? A: Dog crate water bottles are usually placed on the wire wall of the crates. They are kept at a height just a tad bit higher than the dog so that they can tilt their head up and use it. Make sure that the seeping tube is visible to your dog so that it can conveniently use it. Q: Can large pets use a dog crate water bottle? A: Of course, it can! Any size of a pet can use a crate water bottle. The only thing you should pay attention to is whether the size you are buying is big enough to hold enough water for a big dog as it will obviously have a bigger requirement compared to smaller dogs. Otherwise, you will just find yourself refilling throughout the day. Q: Why does my dog crate water bottle drip? A: One drop of water on the outer edge of the seeping tube does not mean that it’s continuously dripping, it just means that the vacuum has reformed and water will not come out anymore. On the other hand, if you notice that your bottle is emptying itself out/ or is dripping continuously then you should check the bottle for leaks.